I found myself writing similar code to deal with the growing number of Rest queries on this site such as Get Data from Google Books, Integrating Excel with Maps and Earth, Get Data From Google Docs and a whole lot of other Web Services. It occurred to me that some small enhancements of How to use cJobject and of How to use cDataSet, along with the library idea in Regular Expressions could result in a useful library and class object that could be used to process any Rest queries without having to bother with any repetitive coding in the future. You can use the Rest Results Explorer to research your targeted API and help decide whihc data fields you want to import to your worksheet. RESTful queries - what are they ? Well you can read the detail here, but in simple terms, you provide a URL including a query and some xml or jSon is returned containing the response. The objective of this cRest class is to provide a simple way to do that and populate excel with the results, and of the library is to create a repository for frequently used Rest query and response details you can build into any projects that might need to retrieve such data. What has this to do with Excel? Well it would be nice if you could just populate a sheet with the results of such queries without worrying about the details. The rest library and cRest class is for exactly that. generalDataSetQuery "isbnq", "google books by isbn", "isbn"
Clearly the above needs some setup. If it is a 'known query' (one already in the restLibrary), the Url for that type of query is already known so you can refer to it by its entry name. If not, then you can either add one to the library, or pass the URL as an argument. More about that later. These queries can return a lot of data. Much of it could be irrelevant for you. To select which data you want, then you need to simply name the columns to match the names in the query reponse data. See Adding to the rest library for how to do that. In the examples given, I have provided a simplified calling interface. There are a couple of deeper levels you can go to if you want to use some of the more advanced options. More about that later too. For the moment here are the 2 generalized simple interfaces. 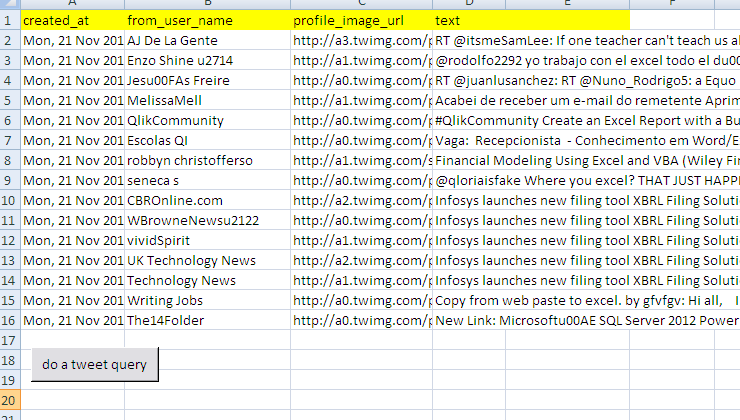 For the type of query where one query returns multiple rows, like the twitter example. and where each row contains input for the query, for example geoCoding. You can see that in each case, restQuery is called with slightly different argument structure and searches the restlibrary created above..